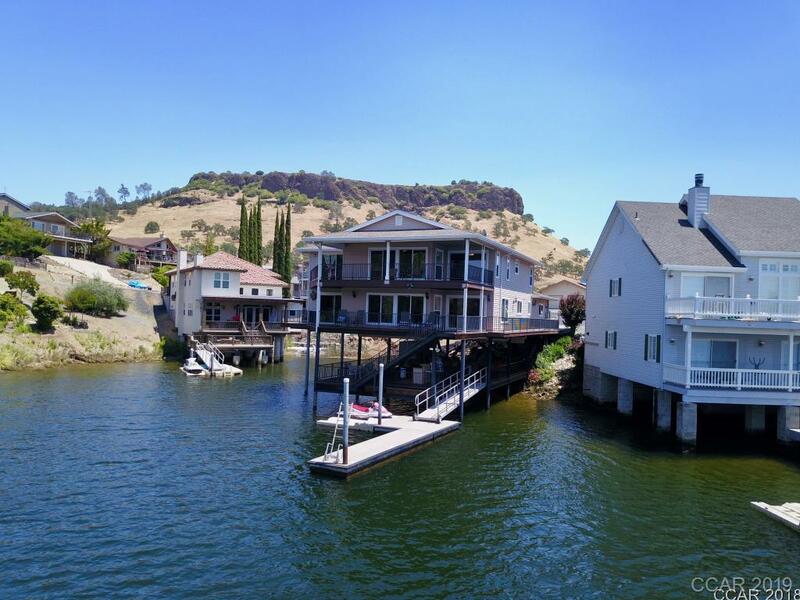 This premium Lake Tulloch waterfront home is truly one of a kind. Completely built OVER THE WATER on a steel super structure, this home has virtually zero maintenance. All primary living areas including the entry, kitchen, great room, master bedroom, laundry and two car garage are located at street level for possible daily living WITHOUT STAIRS . Four guest bedrooms, two baths and family room upstairs with separate A/C zoning. At the lakeside, enjoy nearly 1500 sqft of overwater low maintenance decking for the ultimate in lake life. Concrete boat dock will berth two boats. Located on the main lake, this home has some of the best views that the lake has to offer! Directions: Gate 1, Left On Poker Flat, Right On Sunrise, Left On Sandy Bar. Home Is At End On Right. Please complete the form below with your contact information and any details that will help our agents to find you your dream home or property. © 2019 Calaveras County Association of Realtors All rights reserved. Information deemed to be reliable but not guaranteed. The data relating to real estate for sale on this website comes in part from the Broker Reciprocity Program. Real estate listings held by brokerage firms other than Premier Properties are marked with the BR logo and detailed information about them includes the name of the listing brokers. Listing broker has attempted to offer accurate data, but buyers are advised to confirm all items. Information last updated on 2019-04-22.